A number of people in Azerbaijan who voted for a song by neighbouring Armenia in the Eurovision Song Contest have been questioned by the police. One man told the BBC he was accused of being unpatriotic and a "potential security threat", after he sent a text backing Armenia's song, Jan Jan. The Azerbaijani authorities said people had merely been invited to explain why they voted for Armenia. The two states fought over the disputed Nagorno-Karabakh region in the 1990s. A total of 43 people in Azerbaijan reportedly voted for Armenia in the competition, but it remains unclear how many of them have been questioned by police. Svante Stockselius, executive supervisor of the Eurovision Song Contest, said the European Broadcasting Union (EBU) was investigating the situation. In November 2008, the Armenian and Azerbaijani leaders agreed to intensify their efforts to find a political settlement to the row over the territory. They said they had made significant progress at talks in Prague in May on the sidelines of the EU's Eastern Partnership summit. 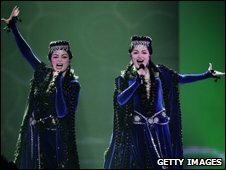 The BBC's South Caucasus correspondent, Tom Esslemont, says it is unclear why the Azeri authorities have chosen to call people in for questioning three months after this year's Eurovision song contest. Civil rights campaigners say freedom of expression is increasingly suppressed in Azerbaijan under the presidency of Ilham Aliyev. Through this latest row, some have even accused his government of attempting to provoke tensions with Armenia, 15 years after the war over Nagorno-Karabakh left the two countries scarred and bitterly divided, our correspondent says. Can thaw unstick frozen conflict?